Chef and owner Troy Guard’s breakfast version of loco moco at HashTAG in Denver. By now, diners are more than familiar with poke, the Hawaiian raw fish salad that has been sweeping the fast-casual segment. Now, another popular Hawaiian dish is gaining traction on menus: loco moco. A popular comfort food in Hawaii, loco moco is a mound of white rice topped with a hamburger patty and a sunny-side-up egg, smothered in gravy. As locals tell it, loco moco was invented in Hawaii in 1949 to feed hungry teenage surfers, and over time the dish became a staple there. Eureka!, adjacent to the El Cortez Hotel and Casino in Las Vegas, offers a modern spin on traditional loco moco, made with a rice patty topped with an Angus beef patty, shiitake mushrooms, gravy, a fried egg, chives and sesame seeds. Diners can enjoy the dish with a draft beer from Maui Brewing Co. 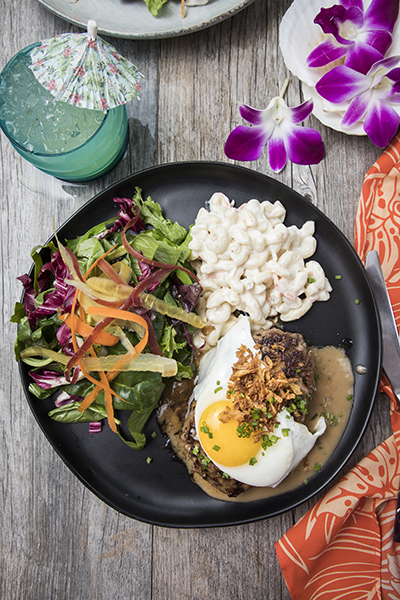 But the growing interest in Hawaiian cuisine doesn’t end with loco moco. It extends to other iconic dishes and ingredients as well. In the contiguous United States, the term “Hawaiian” is growing across appetizers, entrées and sides, according to the latest research from Datassential MenuTrends. Fifteen percent of menus feature the term, an increase of 5 percent in the last year and 7 percent over the last four years. This includes distinctly Hawaiian dishes such as loco moco, as well as lomi salmon, laulau, poi, lilikoi and chicken long rice. Other items that are finding growth on menus include kalua pork and Spam, which is consumed more in Hawaii than in any other state. A Hawaiian native, Guard often incorporates his roots into his menus. At HashTAG, a breakfast joint, he offers a version of loco moco prepared with meatloaf, two fried eggs, kimchi fried rice and mushroom gravy. At Mister Tuna, Guard’s woodfired and rotisserie restaurant with a menu inspired by his childhood in Hawaii, he serves dishes such as fried rice with Spam, with a fried egg, scallions, kimchi and cilantro salad. At TAG Restaurant, he serves OG Taco Sushi with charred Hawaiian ahi tuna, sushi rice, guacamole and li-hing mango salsa. Li-hing is a powder made of dried plums, often sprinkled on fruit in Hawaiian cuisine. It has a sweet-and-sour, slightly salty taste. The soon-to-open, 6,500-square-foot Wiki Wiki Sandbar in Folly Beach, S.C., will feature a menu that draws inspiration from co-owner Karalee Nielsen Fallert’s travels to Hawaii and the islands’ traditional “plate lunch” comprised of an entrée, two scoops of rice and a scoop of macaroni salad. Chef Jason DuPree’s menu will include loco moco, poke bowls, Southern fried coconut shrimp, grilled Kona Kampachi, and a Spam slider. In summertime, Bryan Podgorski, executive chef at the Kimpton Everly Hotel in Los Angeles, goes whole hog on Hawaiian cuisine — literally. For the hotel’s weekly summer Sunday Fundays at The Skyline rooftop deck, he offers a complimentary whole hog roast and cash-bar cocktails. “We wanted to do something different for these events that allow our guests to try and see something that not a lot of people often get to outside of Hawaii,” Podgorski said. To prepare the traditional luau staple, Podgorski brines a nearly 100-pound hog for 24 hours in an aromatic liquid with thyme, garlic, bay leaves, salt and sugar, and lets it rest another day before cooking it in a caja China, a portable oven often used for roasting hogs, for about five hours. The crispy-skinned pig is paired with sides such as pineapple-papaya slaw, sweet rolls and fried rice.